Home » Buyer's Guides » What is the Best Slow Cooker to Buy? What is the Best Slow Cooker to Buy? If you’re strapped for time but want to feed yourself or your family healthy home cooked meals, a slow cooker is an indispensable tool in the kitchen. You can add all the ingredients from a one pot complete meal recipe to the pot, close it, turn it on and leave the house. When you’re done at work and get back home in the evening, your meal will be ready and waiting for you. If you’re cooking for a party, include a slow cooker dish in the menu because you can start with this dish and let it cook without your supervision while you tend to the other more complicated dishes. But what is the best slow cooker to buy? The choices range from simple cookers with a dial to select between just two power levels, to high tech cookers that can do lots of fancy things and are controlled by a touch pad panel. Sizes vary too and you can get small ones meant for cooking a meal for two to very large family-sized ones. Let our slow cooker buying guide help you pick out the best one for your needs. One of the best benefits of slow cooking is that it saves you time. Having a slow cooker at home makes it easy to prepare meals and you’ll be less likely to go eat fast food, which is expensive and not healthy. Slow cookers cut down on preparation times and you don’t have to do as much cleanup. Another benefit of using slow cookers is that they don’t heat up a house like an oven does. A slow cooker is good for any season. They are also more energy efficient than ovens. You don’t have to purchase expensive meat to put in a slow cooker. The slow cooker will tenderize inexpensive meat by breaking down the fibres. Same goes for fibrous vegetables. Slow cookers also bring out flavors from all of the ingredients, as they have time to stew in the juices. Slow cooking is more healthy because you can use less oil. Since the slow cooker uses lower temperatures compared to other kitchen appliances, foods have more time to release their own fats and water to cook the food. It’s almost impossible to burn your food. No need to keep adding liquid to the dish and food doesn’t dry out. It’s still wise to be careful when cooking because if the cooker turns off automatically when time’s up, the food should not just sit inside for too long before you eat it, as this causes it to spoil. It’s important to not boil some raw beans using a slow cooker. A slow cooker doesn’t get to a high enough temperature that kills toxins compared to other stove top boiling methods. Some types of beans that you shouldn’t cook in a slow cooker are raw kidney beans, broad beans and fava beans. It’s important to boil beans before you place them in a slow cooker to prevent poisoning. How Does a Slow Cooker Work? A slow cooker works by heating up your food using in-built heating elements under the pot and inside the casing. Slow cookers have a few power settings that you can choose for low or high temperature settings, and they are able to cook food for up to 12 hours. You typically select a higher power rating when cooking for about 3 hours, and a lower setting if you cook for longer than that. Programmable slow cookers are generally more expensive compared to manual slow cookers. Programmable slow cookers offer more options to choose from and there’s a digital display. You can digitally set how many hours you want your food to cook and select a specific temperature. This is typically anywhere from 30 minutes to a few hours. Some models allow you to set a start time for cooking in advance. The cooker will also automatically turn off when the time is up, but many models offer a keep warm setting so that the food stays safe and warm until you’re ready to eat. A few electric slow cookers may have combination cooking to switch from slow cooking to sautéing or steaming and vice versa. These have Teflon coating on their inserts and more temperature settings. Some have different cooking modes for versatility. This gives you a lot of variety, as you can use a special mode for electric pressure cooking, for steaming, or even rice cooking. The most versatile slow cookers are also called multi-cookers. Manual slow cookers are basic. They don’t offer as many features as programmable slow cookers, but they are less expensive. Manual slow cookers usually only allow you to set the temperature on low, medium or high. There is no timer so you can’t leave it for too long and come back and you have to manually turn the machine off. There may be a manual “keep warm” setting that you can use of you’re not ready to eat as soon as the cooking is done. What Size Slow Cooker Should I Buy? The slow cooker size you need to consider depends on how many people you cook for and the types of meals you plan to cook. Slow cookers come in various sizes. A 2 quart slow cooker is best for feeding one to two people. A family of three to five will need a 6 quart model. To feed over five people, you need to get an 8 quart model, or purchase the biggest slow cooker that you can find. If you are wanting to cook big pieces of meat, you’ll need a pot that is 6 quarts. If you can afford it and can cook in larger batches for freezing, it’s best to get a bigger slow cooker. The more space you have means that food will cook faster and easier. However, this does decrease efficiency if you don’t fill it up enough and you shouldn’t have the slow cooker less than half full. It’s important to consider the shape of a slow cooker that you want to buy. Even though vegetarian stews or meat dishes with smaller pieces are fine in round cookers, big and long pieces of meat don’t do well with round slow cookers. Oval slow cookers do best with chicken, ribs and roast. You may also find some rectangular models that work just as well. An oval slow cooker will mean that you’ll need more space for storage, however, you should consider letting it stay on the kitchen counter if you intend to use it often. Slow cookers have an insert that you fill with ingredients, and that sits inside the heating pot. Some slow cookers just have heating elements on the bottom of the exterior pot, and others have heating underneath and along the sides of the slow cooker. Heating elements only on the bottom don’t cook food uniformly unless you stir everything now and then. Dryer dishes may start to scorch at the bottom too. The insert is the cooking pot that sits inside the heating pot and this is what you fill with ingredients. These inserts are made out of a variety of materials. Ceramic and porcelain are the most commonly used inserts but you can also get metal ones. Some inserts come with Teflon coating so that you can partially saute or sear foods before switching to the slow cooking mode. The cookers that come with a Sear function allow you to do this in the cooker itself. Some inserts are safe to use on a stovetop for this part of the cooking process but check to make sure. Do NOT use metal spoons in a Teflon coated insert. Usually, lids for a slow cooker are glass so that you can see inside the pot without lifting it off, which can cause the temperature to go down. It’s best to choose a lid that has a secure fit to prevent accidents. Some slow cookers have locking clamps for safe transport, and some lids can be removed completely. Hinged lids make cleaning a bit tougher. If you’re looking for a slow cooker that is easy to clean, you may want to consider purchasing one that’s dishwasher safe. The outside of a slow cooker is always easy to clean. Most of the time, inside the slow cooker is easy as well. If you have to hand wash, don’t use rough scrub pads to clean Teflon-coated inserts. The best way to safely clean these is to let it soak a while in water to loosen dried food and then use a soft scrubber to soap it. Slow cookers are generally safer to use compared to ovens and stove tops, although you can still get burns if you accidentally spill the ingredients. Some slow cookers have the option to lock the lid for transport purposes. You can cook your meal and then load it in the car to take to a picnic without worrying about spilling anything. 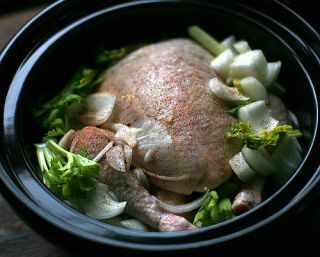 A slow cooker with a built in meat thermometer is useful when you cook large cuts of meat or a even a whole chicken. Because slow cookers don’t reach very high temperatures, you have to ensure that you cook meats long enough to get it to reach a safe temperature right in the middle. A temperature probe that’s there from the beginning will let you know and you won’t even have to open the pot to insert your own probe. Some advanced models will automatically switch to the Keep Warm mode once the desired temperature that you set in the beginning is reached. Now that you know what to look for when buying a slow cooker, check out our various “Best of” lists for slow cookers, crockpots and multi-functional cookers. If you’re also looking to replace or get a new countertop oven, you may want to consider a single appliance that can do many things, like toast, bake, broil, slow cook, dehydrate, air fry and more. This kind would save a lot of space in your kitchen and we can suggest two models – the Cuisinart TOA-60 and the Breville BOV900BSS. ← What is the Best Electric Knife Sharpener on the Market? Check out Oprah’s Favorite Things for the Chef and Baker 2018! And some of Oprah's Favorite Things for the Foodie 2017 are also still available! What is the Best Toaster Oven under $100? What is the Best Toaster Oven to Buy in 2018? SmartCookNook.com is a participant in the Amazon Services LLC Associates Program, an affiliate advertising program designed to provide a means for sites to earn advertising fees by advertising and linking to Amazon. Cuisinart TOA-60 Vs Breville BOV900BSS – Which Air Fryer Toaster Oven is Better? ©2019 - Smart Cook Nook. All rights reserved. No reproduction permitted without permission.